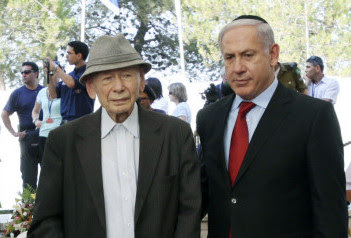 PM of Israel, Benjamin Netanyahu's father, Benzion, passed away today at the age of 102. The elder Netanyahu emigrated to Palestine from Poland with his family in 1920. He was a renowned historian, specializing in the Spanish Inquisition, and a professor emeritus at Cornell University. The father of Prime Minister Benjamin Netanyahu, Professor Ben-Zion Netanyahu, passed away early this morning (Monday), April 30, 2012. Ben-Zion Netanyahu, 102, died at home. Last night, his son, Prime Minister Benjamin Netanyahu managed to visit him one last time. Ben-Zion Netanyahu was born in Warsaw on March 25, 1910, named Ben-Zion Mileikowsky. In 1920, he and his family immigrated to the Land of Israel. In 1944, he married Tzila, whom he had met during his studies in the Land of Israel. Ben-Zion Netanyahu had three sons – the late Col. Yonatan Netanyahu, who fell during Operation Yonatan at Entebbe; Benjamin, the Prime Minister of Israel; and Ido, a doctor, author and playwright. Prof. Netanyahu was among the great historians of the Jewish People. In his research, he focused on the history of the medieval Spanish Jewish community and the history of Zionism. Among his books are a biography of Don Isaac Abravanel, a history of the Spanish Marranos and his major work, 'The Origins of the Inquisition in Fifteenth Century Spain', which received global acclaim. He also authored 'The Founding Fathers of Zionism' about the lives of the founders of political Zionism – Leon Pinsker, Theodor Herzl, Max Nordau, Israel Zangwill and Zeev Jabotinsky. Prof. Netanyahu was the editor-in-chief of the Hebrew Encyclopedia for over a decade. He served as Professor of Jewish Studies at various US universities and concluded his academic career as Professor emeritus at Cornell University. From his days as a student in Jerusalem, he was involved in public Zionist activities. He was a supporter of Zeev Jabotinsky and edited a newspaper that also featured Prof. Joseph Klausner and poet Uri Tzvi Greenberg on its staff. He defended those who were accused of Chaim Arlozorov's murder and, to this end, persuaded his father, Rabbi Natan Mileikowsky, to enlist the support of Rabbi Avraham Isaac Hacohen Kook to defend the accused. Rabbi Kook later delivered a moving eulogy for Rabbi Mileikovsky. In 1939, Ben-Zion Netanyahu traveled to London and persuaded Jabotinsky to relocate to the US out of the view that the latter would be the rising power in the world and that from there it would be possible to mobilize support for the Jewish state. Jabotinsky died shortly after their arrival in the US; Netanyahu continued to raise support for the Jewish state throughout the war and afterward. In this context, he met with many US Jewish leaders of the period, as well as with Senators, Congressmen, authors, poets and leaders, including Dean Acheson and Dwight D. Eisenhower. Upon the establishment of the State, he returned from the US and moved with his young family to Jerusalem's Talpiot neighborhood. He dedicated himself to his research, in which he was assisted by his wife Tzila, a native of Petah Tikva who was his life's partner for over 50 years. In 1952, the Netanyahu family moved to its home a 4 Haportzim Street, where he passed away early this morning. Hamakom y'nachem etchem b'toch sh'ar avelei Tziyon viY'rushalayim. "May the Almighty comfort them with all of the other mourners of Zion and Jerusalem."